A simple mount used for positioning technology on the edge of tables and desks. 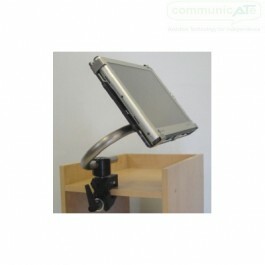 The Desk Mount with Clamp Base is most commonly used in conjunction with one of the DAESSY wheelchair Mounts. A variation on the standard Desk Mount, the Clamp Desk Mount can be attached to almost anything including tables, desks or tray edges (although the rigidity of the tray and any existing tray lips must be considered). The surface must be between 1.3 cm and 5.5cm thick. Consisting of a SuperClamp base, a U-shaped tube and a DAESSY Quick Release BAse, the mount can be adjusted easily and is compatible with all DAESSY device adapter plates. Adapter plates are purchased separately. The Super Clamp is rated for 3.6 kg so large or heavy devices should not be used with this mount.